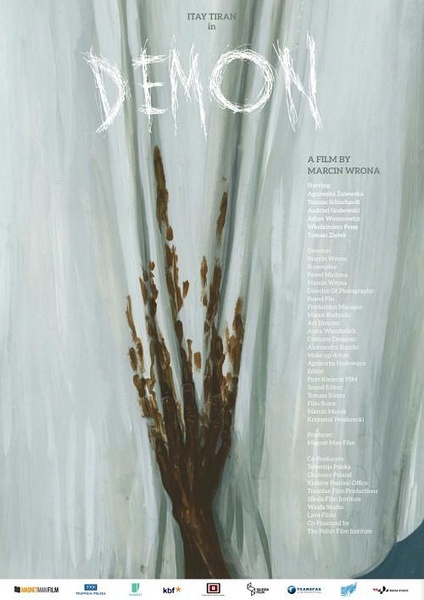 Demon (Marcin Wrona, 2015) – Make Mine Criterion! Early on in Demon‘s doomed wedding reception, an old Jewish teacher (Wlodzimierz Press as Szymon Wentz) states in a rambling toast, “There’s no man without society and there’s no society without memory.” By the film’s conclusion, after too much rain, too much vodka, and too much of the convulsing spectacle of the groom possessed by a dybbuk (the spirit of a young Jewish woman who claims him as her own), the bride’s father (Andrzej Grabowski as Zygmunt) declares to his ragged guests, “We must forget what we didn’t see here.” Between these two lines of dialogue, Marcin Wrona’s Demon explores our relationship with history and, in particular, Poland’s relationship with its virtually lost Jewish culture. Wrona’s co-writer, Pawel Maslona, has remarked that the “Jewish thought … was annihilated during the second World War” from the Polish identity. Prior to German occupation, more than 3 million Jews lived in Poland, counting for nearly 10 percent of its population and making it the most densely Jewish-populated nation in Europe. By the war’s end, only 380,000 were left. Poland remains haunted by the cultural grief over this decimation and the guilt of Polish complicity, with redeveloped ghettos and abandoned synagogues declaring this absence today. Other recent Polish films, like Wladyslaw Pasikowski’s Aftermath (2012) (based on Neighbours, Jan Tomasz Gross’s 2001 historical exposé of a WWII massacre) and Pawel Pawlikowski’s Ida (2013), have similarly dealt with the same issue but Wrona’s film distinguishes itself by packaging its cultural anxieties in the horror genre and hoping to achieve an enhanced accessibility in the process. Acclaimed Israeli actor Itay Tiran stars as Piotr, a Polish-Brit who arrives in southern Poland to marry his fiancée Zaneta (Agnieska Zulewska) and to meet her family – industrialist father Zygmunt and status-conscious mother Zofia (Katarzyna Gniewkowska) – with the support of Zaneta’s vodka-plying brother Jasny (Tomasz Schuchardt). Piotr and Zaneta promptly move into her grandfather’s rundown rural estate which also doubles as the location of their wedding and reception. While Zaneta is off with her friends, Piotr begins enthusiastically digging a pool with a backhoe and discovers a skeleton buried in the ground. Unsure of what to do and unable to find assistance, he fills the hole back in and proceeds with his wedding the next day, but all is not well. Piotr is haunted by visions of Hana, a young Jewish woman in a wedding dress, and he becomes increasingly disoriented, suffering from nosebleeds and seizures until eventually Hana assumes full control of his body and, speaking Yiddish through Piotr, refuses to release him. Yet while Piotr’s possession is fearsome and distressing, Demon assumes an absurd edge as Zaneta’s parents refuse to allow Piotr’s condition embarrass them or their daughter, plying their guests with music and booze in hopes that they can dance and celebrate their way through these horrors. The film depicts this awful hole in the ground. Imagine you’re digging a hole and you uncover something awful, something you can’t handle seeing. You have two choices: you can either bury it again and try to forget, or you can painfully keep digging at it, to find out more and see what’s still further underneath. For Wrona and I, the right choice was obvious. Digging is good. You do want to know, to cope with your full identity before you can grapple with things that aren’t plausible or good. It was Marcin’s first intention, I believe, to make a film about memory and how the past vanishes in our lives, though it’s always present, in some way. You might find the corpses or bones or remains of previous experiences. If we are willing and able confront our own pasts, and our cultural pasts, we’re evading a demon. Though, that demon may bring you things you don’t want to see, or tell you things you don’t want to hear. Demon goes out of its way to suggest that Piotr stands as a potential bridge between the traumatic past and the wilfully blind present. 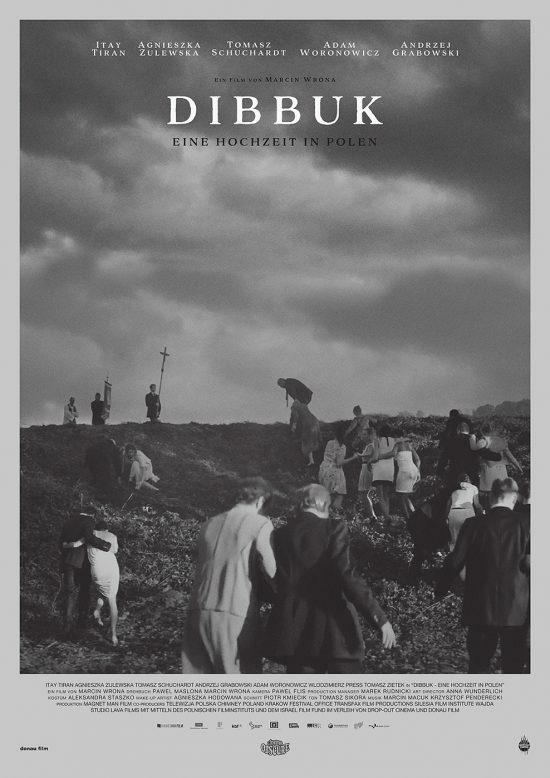 His Polish heritage recalls the escape of many Poles to the United Kingdom during World War II, he suggests an unknown Jewish heritage through inadvertent actions (such as his crushing a glass under his foot during the wedding ceremony), and he proposes to literally rebuild a bridge to the town that was destroyed during the war and never reconstructed. Wrona’s Demon most quickly brings to mind the uncanny paranoia of Roman Polanski: the slow burn dissolution of identity, the abiding awareness of ostracism and xenophobia, the body horrors of physical betrayals before mental breakdowns. Evocations are also made to the uproarious Russian Orthodox wedding of The Deer Hunter (Michael Cimino, 1978), the absurdity of a never-ending dinner party in The Exterminating Angel (Luis Buñuel, 1962), the comic corruption of a community in The Firemen’s Ball (Milos Forman, 1967), the liquor and music fueled carnivalesques of Emir Kusturica, and the haunted history of Stanley Kubrick’s The Shining (1980) (a connection made most notable by a single late shot in Demon and the presence of Krzystof Penderecki’s compositions). Demon is more specifically adapted from Piotr Rowicki’s 2008 play Adherence, although it certainly owes debts to earlier works like Shloyme Zaynvl Rapoport’s 1920 play The Dybbuk: Between Two Worlds, which was later filmed in Poland in 1937 and served as the basis for many Yiddish talkies, and Andrzej Wajda’s The Wedding (1971), an adaptation of Stanislaw Wyspianski’s play that also used a wedding to critique Polish nationalism. Cinematographer Pawel Flis imbues the film with the air of history, crafting with Wrona a film designed to recall in its look the greys and yellows of an old photograph, although one that transitions with the help of editor Piotr Kmiecik from staid and static to wild and distorted. Itay Tiran’s captivating performance as the groom is naturally central to Demon‘s success. Tiran is a celebrated theatre actor, notable for a break-out performance as Hamlet with the Israeli Cameri Theatre, and he rehearsed and researched with Wrona extensively, even going so far as to work with a modern dance choreographer and a Jewish theatre choreographer to develop his “dybbuk dance.” Tiran’s connection to Hamlet is particularly loaded when placed alongside Demon. For many, Demon provides room for a non-supernatural reading that ascribes Piotr’s breakdown to depression or mental illness, something that Zaneta’s family openly wonders at but takes little action to help with. This lack of support is further elaborated upon by failures of various figures of community support – namely a priest anxious to leave and unwilling to consider the otherworldly causes of Piotr’s condition and a doctor open to such possibilities but too drunk to provide any meaningful assistance. Wrona’s producer and wife, Olga Szymanska, asserts that Wrona aimed at ambiguity in Demon, remarking that “you can choose a metaphysical ending or you can choose a realistic ending.” Reading Demon as a statement on depression and mental illness is undoubtedly encouraged by the tragic shadow cast on the film by Wrona’s suicide, hanging himself in a hotel room in September 2015 after the film’s Polish première. Wrona had an unusual upbringing, the son of a violent man who would beat his wife, torment his children, and who made his living as an exorcist, a profession Marcin observed firsthand. Marcin Wrona studied film in Poland and became one of the country’s most promising directors in television and film. His brief professional output reveals Wrona as an artist intent on tackling uncomfortable social issues, such as the plight of migrants in My Flesh My Blood (2009) or Poland’s Jewish history in Demon. With his death, an important voice in cinema was lost just as it was beginning to truly flourish, although we are lucky to have Demon as a final statement from Marcin Wrona. The Criterion Collection’s interest in scary movies tend towards art-horror and Demon is a modern art-horror masterpiece. Wrona’s film is full of slow-burn terrors, heavy atmospheres, audacious cinematography, gallows humour, stunning performances, and a powerful attention to history and social construction. While its distribution by The Orchard might make it an unlikely title for a wacky “C,” Demon has no hi-def hard media release in North America and it could easily rub its shaking shoulders with Herk Harvey’s Carnival of Souls (1962), Nicolas Roeg’s Don’t Look Now (1973), and Guillermo del Toro’s The Devil’s Backbone (2001). Perhaps most importantly, there will sadly never be another Marcin Wrona film to vie for admission into the Collection, making recognition of Demon‘s brilliance all the more necessary. Despite having no literal connection to the film, MMC! is fond of this poster treatment for a CC cover as the soiling of white fabric by a mouldering hand reflects both Demon‘s compromised celebration and the Collection’s taste for minimalist and evocative art. Credits: The current hard media releases for Demon have virtually no special features. We’ve imagined a set of interviews with the two leads and Wrona’s producer/widow and have named it after the Yiddish lullaby that the dybbuk sings through Piotr. We’ve also tapped film critic and friend of the Collection J. Hoberman to provide an essay given his inclusion of Demon among his top 10 films for 2016 and his avowed support for the movie. This post owes great debts to Olga Szymanska’s interviews with Behind the Lens Online and Carlos Aguilar of MovieMaker, as well as reviews by J. Hoberman for Tablet, Anton Bitel for Little White Lies, Stuart Liebman for Artforum, Manohla Dargis for The New York Times, Simon Abrams for RogerEbert.com, Emily Gaudette for Inverse, Katie Rife for The A.V. Club, and Joshua Brunsting for CriterionCast and reflections on Demon and Wrona by Ofer Aderet for Haaretz and Giuseppe Sedia for The Krakow Post. Next Article Buried Alive in 2018!